Oh my goodness. I was skeptical about this as I mixed it up but I am amazed at how good it tastes! This dessert counts as a protein, so for me, it works best on a day I'm busy and don't have time to cook up two proteins for meals. Or if you're just craving chocolate, it'd be worth planning to have this dessert as a protein. Yum! If you like cheesecake, I think you'll like this. It would also make a fabulous fruit dip - for apples or strawberries! Puree all ingredients together and adjust stevia to the sweetness you like. Start with just a few drops and add one a time until you like it. Enjoy! 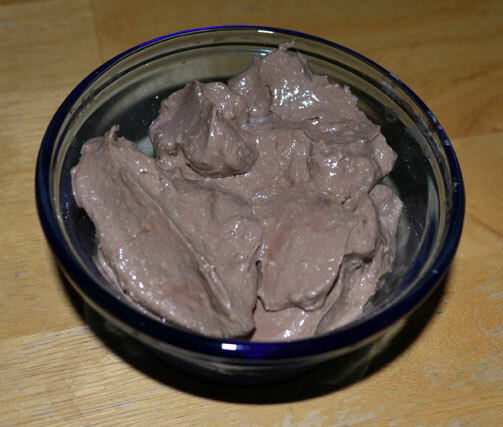 I made this with cottage cheese and cocoa with vanilla creme liquid stevia AND frozen sliced strawberries! Yummy! Thanks for the idea!! Hi. Did either of you have a gain after eating the "rogue" ingredient? I'd like to know the answer to Chrystal's question too. Did you gain after using the rogue ingredients? Also I have been doing the HCG diet for awhile now and my doctor told me if I was to cheat that I would have to do a apple day in order to get back on track. Did you gain and have to do the apple day when using your rogue ingredients? Just curious...thanks! Just made this to get a second meal in today while not eating to eat. Love this! Has anyone tried it frozen? Wonder how it would freeze. Sounds delicious, let us know if you try it! In my p2 hcg 6 days into it...Tried it with strawberries jam and skipped the stevia and vanilla, oh my god, it tastes just like strawberries chocolate mouse!! This was a sunday treat though, i wouldn't do this every day of course. Next time to cut the cal, i will use just strawberries, frozen or fresh ...this time i craved so much a dessert that i just needed it to try this...thank you!!! I made this last night it was amazing and added it to my blog Linking to you. Thank you so much for your recipes. I think you are going to make my P2 protocol so much better!!! What is the rogue component of this recipe? The cottage cheese? I thought that was an allowable item in the original protocol? Enjoying your blog. Thanks! I'll still eat this, even when I'm not on HCG. Sour cream or ricotta works too, but only allowed on Phase 3! Used immersion blender, and am now enjoying a yummy dip/snack with strawberries. Starting my 2nd week, and already lost 10 pounds! Love this, thanks so much! I don't know WHAT I'm doing wrong. But I cannot get the flavors to work. It's just not getting a sweet taste. I'm afraid if I add too much stevia it will become really bitter. Bummer! It's tricky to sweeten bitter cocoa powder with just liquid stevia. What kind of stevia do you use? I honestly have only found one brand I really, really like and that is NuNaturals liquid version. None of the powdered versions taste good to me at all. How long have you been off of sugar? I don't like the taste of this if I've had sugar (real sweetness) relatively recently, but when I've been off for a while, even just plain strawberries taste sweet and this becomes something that really tastes good. I tried both plain, liquid Sweetleaf (Stevia) and I also tried it using Vanilla Creme Sweet Leaf. I've only been doing HCG's VLCD (P2) for about 10 days but I wasn't a big sugar person before hand and I used Splenda in my coffee and baking. I used FF Cottage Cheese because my hubby bought the wrong kind so I'm wondering if that, possibly, had something to do with it? It could be the FF cottage cheese, or even just the brand. I have found that I hate daisy brand cottage cheese, but I like the others I've tried. I too only found one brand of stevia I like with no bitter after taste and that is KAL liquid stevia. I use it even when I am not on protocol AT ALL! Sweetleaf has a bitter after taste and about a dozen bottles sit in my cabinets of every flavor but I dont use them. I will use Truvia when I want a powder for baking (stevia and sugar alcohol blend-neither a sugar nor alcohol). Not all fat free products are the same! Im more likely to try this on P3. My progress is just too good right now on P2 to have a push back. Just tried this recipe and I think I added a tad too much cocoa powder or not enuff stevia BUT more practice and I'll nail it I'm sure! Still tasted pretty yummo! I love this blog! Found soooo many things I am excited about trying! I start my official ph2 in just one more day! Let the journey to a healthier & happier me begin! Just stumbled into your blog by chance and I thank my lucky stars!!! Excellent variety of dishes and yet so simple!!! thankk you very much and God bless you! Love...love your blog....just starting HCG....very good ideas! On day 7 of my first round of HCG and I'm down 7.6 lbs. This blog has been a GODSEND! I'm so glad I found it!! I made something similar. I used plain Greek yogurt. I read the labels and got the one with the least amount of sugar. I would usually just eat a 1/4 c Greek yogurt, 1/2 tsp stevia, and 1 tsp cocoa powder. I like more of a dark chocolate, so a full tsp might be too much for most. It is what helped me get through Phase II. I also made chicken taco wraps. Use Braggs liquid amino, garlic, ginger, cumin, black pepper, and cayenne pepper to taste and 3.5 oz of ground chicken or turkey. After cooked put on iceberg lettuce leaves and a little bit of salsa and enjoy! Delicious! I couldn't have made it through 7 weeks on P2 without this cheater recipe. You're a goddess in my book, Lianne! I cant get this to blend it my blender..the cottage cheese stays under the blades..any tips..?? Which vitamix do you have and do you blend this in that..?? Oh that is tough. I wonder if you made a double recipe if the higher volume would allow it to mix? Thank you! I really don't care for chocolate delight but I have a feeling I'm going to love this for tomorrow.